The statue erected by public subscription by the people of Launceston was unveiled by the Governor of Tasmania on the 9th December 1918. 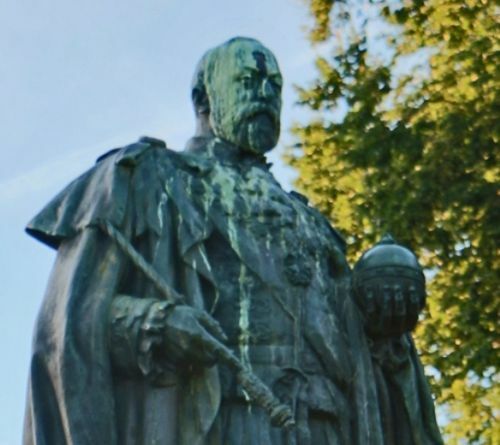 The bronze statute stands 7 feet high and portrays King Edward VII in his "Garter " robes. The statue is a facsimile of one erected in Birmingham, England. The movement to erect a statue to King Edward VII was started in 1910 but the erection was delayed because of World War One. The S.S. Rangatira which was carrying the statue from England to Australia was wrecked off the South African coast but fortunately the statue was saved. The foundation stone had been laid by Lieutenant-General Sir R.S. Baden-Powell K.C.B on June 8th 1912. The total cost of the completed statue was just under £800. Edward VII (Albert Edward; 9 November 1841 – 6 May 1910) was King of the United Kingdom and the British Dominions and Emperor of India from 22 January 1901 until his death in 1910. Britt Omn. Rex. Et. Imp. This stone was laid by Lieut General Sir R. S. Baden Powell R.C.B.